With the Mountain Hut Book, the prolific and trusted guidebook author Kev Reynolds offers an enjoyable and highly informative tour of the hut experience, and recommends some favorite huts and hut to hut traverses. The book is an invitation to new audiences – outdoor enthusiasts whom the author is convinced will become hut-to-hut hikers once he uncovers mysteries shrouding this venerable pastime. Hut novices will come away from this delightful prose traverse of alpine huts full of ideas about where they want to go, what to expect, and how to plan a hut trip. The mountain huts Reynolds extolls are far from the rudimentary garden shed or simple wooden cabin that the word “hut” conjures for many. This book radiates the author’s enthusiasm, and his many positive experiences. He revels in the architecture: “I love the diversity, the sheer variety of hut buildings.” Photographs, mostly by the author, confirm this observation—readers see small stone huts, large stucco lodges, and a few highly sculptural modernist structures. At the heart of the hut experience is, of course, the gorgeous mountain setting. 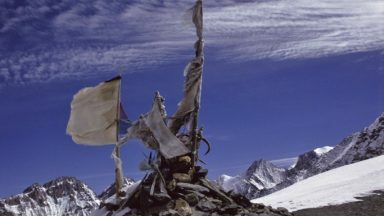 As a serious outdoorsman and guide, Reynolds provides perspective on how huts support trekkers, climbers, walkers, and wildlife watchers in indulging their passion for high altitude pursuits day after day. The experience of taking shelter, and overnighting at the hut is central to this avocation. Reynolds warmly conveys his appreciation of hut warden hospitality — with delightful sketches of some venerable hut guardians — and conjures the convivial atmosphere of mountain huts. “Arrival at a hut invariably comes with a sense of relief, for it’s a guarantee of shelter, somewhere to relax, freshen up, slake your thirst and settle the nagging hunger that comes from a long day’s effort.” Chapter two initiates the reader into the joys of hut life. With friendly conversational prose, Reynolds provides personal accounts, memories, impressions and information on everything from sleeping and eating, to bathrooms to sociability. 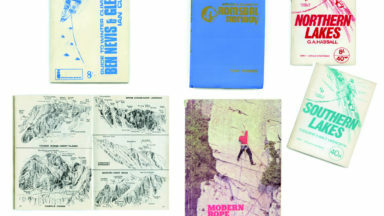 While The Mountain Hut Book is not as detailed as many of Reynolds other 50 guidebooks, it provides expert practical direction to those fired up to learn more. 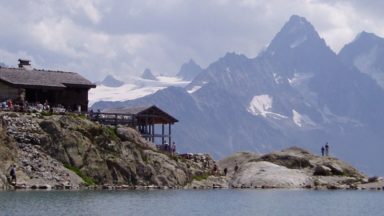 The chapter “Top Ten Huts” highlights a tiny but well chose sampling of these structures, in Switzerland, France, Italy, and Austria. Not surprisingly, the European Alps are closest to Reynolds’ heart; he started his career as a mountaineer and guide, and has written extensively on hiking, mostly in the high heart of Europe. “Hut to Hut,” the next chapter, presents a selection of ten classic multi-day routes in order of difficulty. Illustrated with photographs of massive peaks which dwarf huts below, pristine lakes, verdant meadows, the descriptions are guaranteed to get the reader dreaming about their next walks. This chapter includes clear maps, brief but useful route descriptions, and practical information including hiking times, level of difficulty and scenic features. Recommended guidebooks, many available from Cicerone Press, include even more detail about these classic walks. Finally, Reynolds sketches in the larger context mountain accommodations. Looking beyond the European alps, he offers brief information about bothies, lodges and huts in other parts of the world. Reynolds omits information about huts in Greece, Slovenia, Scandinavia, Australia and elsewhere. His focus is on high mountain huts; the book is not intended as a comprehensive view of huts. Using the European alps as the model, it admirably evokes and explains the mystique of the high alpine hut experience. The Mountain Hut Book fills a gap in the literature and is highly recommended for purchase as a gift – for ones-self, friends and family – and for purchase by libraries serving communities with interest in the outdoors. Many think of mountain huts just as simple shelters, but this book explores what makes staying in them such a special, unique experience. Kev first visited in the Alps in the 1960s and has returned almost every year since, visiting and staying in hundreds of mountain huts in all regions. Drawing upon this knowledge and his own personal experiences, The Mountain Hut Book highlights the best Alpine huts to stay in and examines hut life, what facilities and meals you can expect and hut etiquette. Kev explores how huts have developed over the years due to the remarkable increase in outdoor activity to what they are today; simple, reasonably priced accommodation and meals situated within easy reach of a mountain. He also reveals his top 10 favourite huts in the Alps and Pyrenees. Not only is it informative, it's really entertaining, with personal anecdotes throughout. A must read for anyone planning a trip to the Alps. ​Who better than veteran mountain trekker Kev Reynolds to expand on the joys of staying in a mountain hut? Who better than veteran mountain trekker Kev Reynolds to expand on the joys of staying in a mountain hut?This latest celebration from Cicerone is a worthy companion to Phoebe Smith's Book of the Bothy, a compendium of British bothies published in 2015. But in this new book, the author doesn't just stick to the better-known mountain huts of Alps, although they are pretty comprehensively covered by a directory of Alpine huts, profiles of 10 of his favourites , and outlines of 10 hut-to-hut walking tours. Reynolds also mentions bothies, huts and lodges way beyond the Alps, extending to the Himalaya, Pyrenees, the Atlas Mountains of Morocco and even to the Appalachians and Canadian Rockies. So what is the attraction of staying in a hut, where the accommodation can range, as the author rightly states, from hovels to hotels! 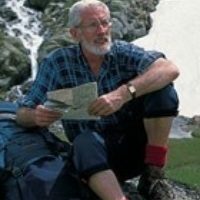 Reynolds says he's with Guild president Chris Bonington, who describes the: " ... anticipatory excitement in a crowded hut, in its Babel of different languages, chance encounters with old acquaintances swilling wine and coffee, the packed communal bunks and the intensity of the early morning start." The "unspoken mystique" that huts were not for ordinary mountain walkers is dispelled by the author, and hopes his book will unravel some of this mystery, and illustrate " ... the way in which mountain huts can be truly sociable places in which to spend a night or two In most magical of locations, To enjoy wild nature at its very best, with spectacular views and a peace unknown in the valleys." Mountain huts add to the unique charm of the Alps, and it was only a matter of time before Cicerone came out with a guide to enjoying the best of them. 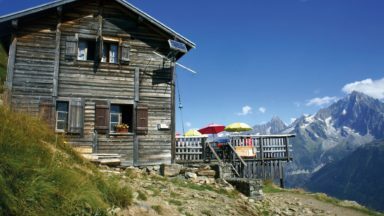 Mountain huts add to the unique charm of the Alps, and it was only a matter of time before Cicerone came out with a guide to enjoying the best of them. This book by Kev Reynolds focuses mainly on the Alps but also includes titbits from around the world - and starts by providing plenty of history, useful information and, most importantly, hut etiquette. A section on his Top Ten Huts' gives a detailed overview of each hut, including maps, a description of possible approach routes, nearby ascents, neighbouring huts for those looking to link up two or more. The 'Hut to Hut' section is particularly useful for those looking to head out on a multi-day trek while forgoing the weight of camping kit. 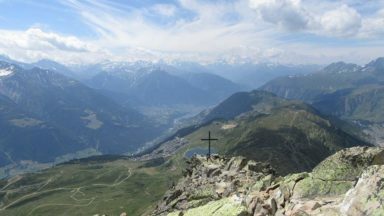 This section includes 10 treks including the Tour de Mont Blanc, the Tour of the Bernina, and the Alta Via 2. Reynolds gives an overview of each route and the huts along the way (though not in the same detail as the Top Ten') and includes a map of the route showing the location of the huts. While this is a great book for those planning to stay in huts for the first time, we also found this useful even though we're based in the Alps, giving us loads of ideas for upcoming trips. Those planning a hut-to-hut trek, such as the TMB, will likely still want a detailed guidebook (such as Cicerone's own 'Tour de Mont Blanc: also by Kev Reynolds), but this book is certainly a great companion for those who haven't yet experienced the pleasure of staying in huts. If you've ever stayed in a hut while hiking in mountains, you'll know just what amazing places they can be. Far from being just a place for shelter, they often bring like-minded people of all nationalities together to swap stories, share laughter and forge lifelong friendships. This is something that Kev Reynolds believes; so much so that he wrote a book about it. The Mountain Hut Book explores what makes the mountain hut experience so special and how things have changed or evolved over the years. Written in an informative and entertaining style, the book also looks at Kev's personal favourites and holds suggestions for some truly incredible hut-to-hut hiking routes. It's practical, interesting, and deserves a place on the bookshelf of all that have enjoyed (or wish to enjoy) staying in huts. Although it covers a lot of ground, the information in this book is very accessible and provides an entertaining read. It is a useful addition for any mountain trip in which the use of huts may be involved. It is a lovely book with many interesting ideas for trips and gets across the feel of what an Alpine hut is all about.